On April 18, 1898 my great-grandaunt Trinidad “Trini” García married Victor Federico “Freddie” Goldbaum in Ensenada, Baja California. She was born about 1878 in Alamo, Sonora, the daughter of Francisco García (~1843-~1899) and Rosario Moraila (~1857-17 Nov 1924). He was born 20 October 1862 in San Francisco, the son of Louis Goldbaum (1832-1899), a Jewish immigrant from Breslau, Prussia, and Librada Valenzuela Grijalva. For my great-grandaunt Trini, this marriage was a major social boost. The Goldbaum family is rightly considered one of the pre-eminent founding families of Ensenada, and I will have more to wrote about them later. But this story really is about a particular project undertaken by my cousin, Trini’s daughter Enriqueta (“Queta”), who was born about 1900 in Ensenada, and her husband José María Dávila, born about 1898 in Mazatlán. José María was a talented songwriter and entrepreneur in the theatrical life of México City. He and “Queta” were a part of the cafe society of the capital, mingling with artists and prominent cultural figures. José María was also involved in politics; he would become Mexico’s ambassador to both Brazil (1941) and Guatemala (1945). One of the artists Queta and José María befriended was the celebrated painter Diego Rivera (1886-1957), who was married to Frida Kahlo. Rivera was especially captivated by Cousin Queta. He asked to paint her portrait. 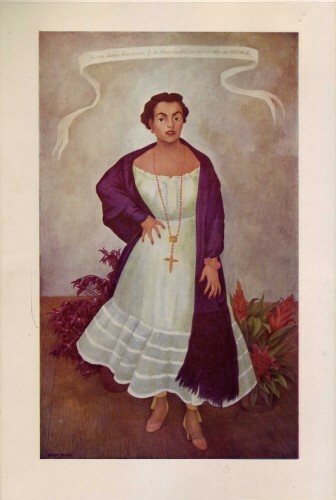 Queta thought the request a bit unconventional, but told Rivera she would agree if he would also paint the portrait of her daughter Enriqueta (“Quetita,” born in 1927 in San Diego). And so Rivera painted portraits of Queta and Quetita, luminous, vibrant paintings that are still in the possession of the family today in México City. Later, José María built a major theater in México City on the Avenida de los Insurgentes. 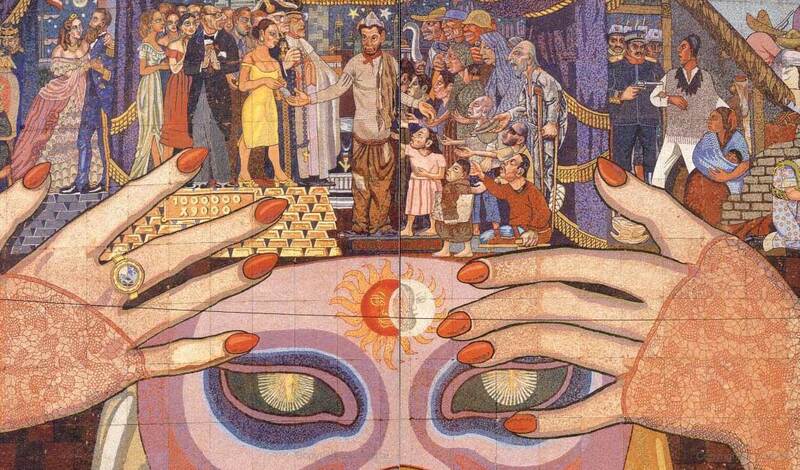 In 1953, at the urging of Queta, he commissioned Diego Rivera to paint a monumental mural on the façade of the theater representing the history of theater in México, to be entitled “la Historia del Teatro.” This mural is considered one of the crowning achievements of Diego Rivera’s career, and was the subject of no little controversy. Toward the end of February, 1953, I was commissioned to do a mural on an outside wall of the new Teatro de los Insurgentes. Designed by the brothers Julio and Alejandro Prieto, this motion-picture house belonged to the master politician and composer of songs José María Dávila and his vivacious and attractive wife, Queta. It was Señora Dávila, chiefly, who was responsible for my being offered this interesting commission. The space I was given comprised the whole main facade of the theatre, facing the busy Avenida de los Insurgentes. The plastic problem here was extremely challenging. For the surface was curved at the top and convex, and most of the people who would see the mural would be passing it quickly in cars and buses. To establish immediately the theme of the mural and the purpose of the building, I painted a large masked head with two female hands in delicately laced evening gloves in the lower central portion. I covered the remaining surface with scenes from plays reflecting the history of Mexico from pre-Colonial times to the present, and converging in the upper center in a portrait of Cantinflas, the Mexican genius of popular farce, asking for money from the rich people and giving it to the poor, as he actually does. It was this scene which precipitated the storm, When only the first charcoal sketch had been done, someone noticed that Cantinflas was wearing a medal of the Virgin of Guadalupe. Immediately there arose a hue and cry. It was blasphemous to connect a low comedy figure with something as sacred as the Virgin. Interviewed by reporters, Cantinflas said that if I had actually blasphemed against the Virgin of Guadalupe in my mural, he would never permit any of his films to be shown in the theater. But my representation could be simply literal, for he always wore the medal in real life. Nobody, Cantinflas said, could either take it away from him or mock his reverence and love. When Cantinflas saw my sketch, he was perfectly satisfied. He even posed with me for pictures on the scaffold beside the place where I had drawn the Virgin. He stood next to me, proudly showing his medal for the public to see in the photographers’ prints. Having Cantinflas’ endorsement, the press came over to my side, pointing out that there was nothing contradictory between Cantinflas and the Virgin of Guadalupe. 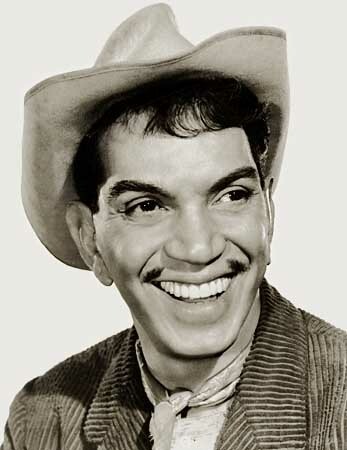 Cantinflas was an artist who symbolized the people of Mexico, and the Virgin was the banner of their faith. A majority of the public subscribed to this interpretation. But the agitation against my painting was not allowed to die away. In fact, it was organized by a gangster syndicate led by professional extortioners, posing as staunch supporters of the Faith. The gangsters’ purpose was to shake down the Dávilas for a percentage of the profits of the theater – their price for tranquility. Not only the Dávilas, but even Cantinflas began to be frightened by the situation, and finally, I myself ceased to find it amusing. So when I got to that portion of the mural where the Virgin had been sketched, I did not paint her in at all, outwitting both friends and enemies, false and true. Executing this unexpected turnabout, I must admit, gave me not a little pleasure. Enriqueta “Queta” Goldbaum de Dávila is my first cousin twice removed. Que bueno que subiste la historia tia, necesitaba esto para hacer una tarea de mi curso de italiano donde me preguntaron cual habia sido el fenomeno de immigracion en mi familia. Te estaba buscando para eso y Moni me dio tu telefono pero creo que estas en San Diego…..te quiero ver!!! Nice work on the website! I stumbled upon your site when i typed in my last name in yahoo. There isn’t many Moraila’s that i know of. People look at me weird when i tell them my last name and they all say the same thing, “I’ve never heard that last name before” If there’s any more information, stories, etc of where the last name came about, and kind of acestory i came from. Ps My Fathers Family which carries the Moraila name is from Mazatlan, Sinaloa. The Moraila name is indeed unusual, and my Moraila ancestors are from Sinaloa as well. We are most likely related. Louis Goldbaum was born in Posen, not Breslau, in a town called Grabow. He was one of my great grandfather’s brother. He migrated with two or three of his brothers to California. Oh i found this site when i searched my last name in google, my last name is Moraila and most of my family is from Sinaloa, Mexico. From Guasave city, actually. I find this to be very interesting! Great story about aunt ‘Queta. As you can see I am Victor Federico Goldbaum, 4th generation in direct line from Aunt Trini and my great grandfather. Thanks for sharing it. I am Maria Lucia Alvarado (Lucille Dunham Minasian) ‘s Grand Daughter. Cousin Eric Stoltz did a great job on genealogy. I did the genealogy in the 1970s minus the photographs and fanciness. We met the Goldbaums in Ensenada, Mexico at the El Presidente Hotel in the early 1970s. My name’s Victor Arjona Gonzalez, 5h direct Generation to Louis Goldbaum. He’s my great-great grandfather, of whom I’ve been searching for more info. In ancestry.com, I was able to find out that he was born in Breslau, Prussia, however, Mr. Roberto Goldbaum says that he was actually born in Posen. Does anyone have any proof or any way of verifying this? PS: Roberto, you just might be my uncle! My grandfather was Cristobal Portillo, I think Queta was his cousin, does that sound correct? 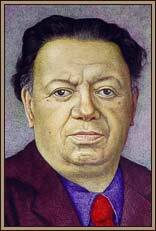 I have mini versions of the Diego Rivera portraits. of Queta and Bebe. Great to see this article. Thanks for this usefull article. Im going to print it for my familly. They will enjoy a little bit of history. Thanks again for your research. Great story on Enriqueta…She also is my cousin, through my great-aunt, Trini Garcia Goldbaum. Hi Rosalie…I just just sent you this link via ancestry .com..so glad you already found eric..he is GREAT at this. I am a researcher on Latin America and the Shoah. My name is Hector Ferreiro Davila, I am son of Magdalena Davila, daughter of Jose Ignacio Dávila, brother of Jose María Davila. My mother used to tell me stories about her uncle who built the Teatro de los Insurgentes, and Queta painted by Diego Rivera. Thank you for the article, I am glad to know more about my grandfather family, which contact we lost because he died when my mother was around 5 years old. Hablo español pero escribí en inglés para que sea más accesible a quienes no hablan español. This post inspired me on investigating more about my family, and after talking with my mother and checking her birth certificate, becuase I couldn’t understand certain things… I found some strange things… My Grandfather Jose Ignacio Davila, and his brother Jose María Dávila, also had the second name Goldbaum. this beacuse they are sons of Gertrudis Goldbaum (who lived in LA when my mother was born), daughter of Louis Goldbaum and sister of Federico Goldbaum. Another interesting thing is that Gertrudis Goldbaum husband is Jose María Dávila “I” Father of Jose María Dávila “II” (We built the theatre) and Jose Ignacio Dávila Goldbaum, my grandfather, who died around 1946. But another interesting thing is that Jose María Dávila is also from sinaloa, just like Trini García wife of Federico Goldbaum Valenzuela. So it seems this two families were tied together for many years, and they were living all along from Sinaloa to California, including Sonora and Tijuana, where another brother of Jose María and Ingnacio (Julio Dávila Goldbaum) settled, I found an article and homenage about him also by googling him. Thanks again for this wonderful post and best regards to all the family! Soy Marcela Ochoa Davila……mi abuelo materno se llamaba Alfonso Davila y su hermano era Jose Maria “Chema” Dávila, él mismo que construyó el Teatro de los Insurgentes y se casó con Enriqueta Golbaum. A mis tíos los recuerdo perfectamente, mi tío Chema falleció a principios de 1973 y mi tía un par de años después. Mi abuelo falleció joven y mi tío Chema paso a ser como mi abuelo. Que increible leer esto. El pasado de mi abuela y bisabuela.